Walking the Creeks of Western New York in search of Fossils. The famous trilobite layers of the Hamilton Group are full of trilobites. 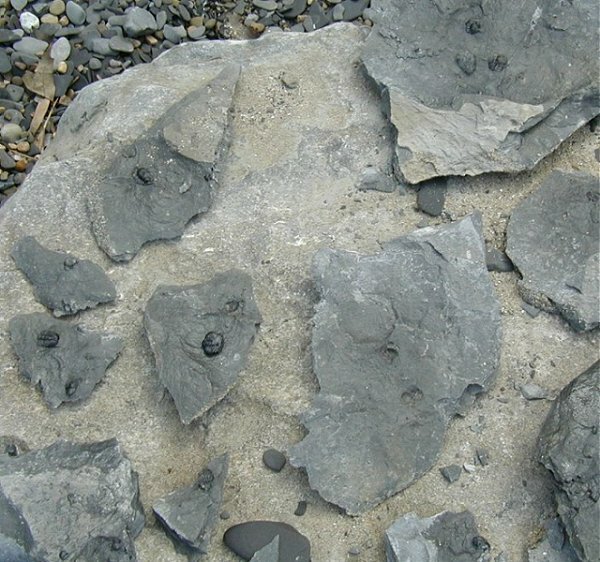 The image shows some of the enrolled trilobites we were finding. Enrolled ones are far more common than prone trilobites. Also, you may notice many are still covered in matrix. They will stay covered until we get them home, where we can properly clean them with an air abrasive unit. During this time period, in the Middle Devonian, a mountain building phase called teh Acadian Oregony was beginning. THe Acadian Oregony started when a landmass called Avalon collided into, what is today, eastern North America. This collision was the first step in the assembly of the supercontinent Laurussia. The collision of Avalon created a large mountain range called the Acadian Mountains along eastern North America. Sediment filled rivers running down the Acadian mountains flowed into the the Catskill basin just west of and running parallel to the Acadian mountains. This basin was flooded by the Kaskaskia Sea. It covered New York west of the Hudson river, as well as many other states down to, what is today, the gulf of Mexico. Sediments from the Acadian mountains accumulated in the Kaskaskia Sea throughout the Middle and Late Devonian. These deposits formed the rock layers seen today in western New York. The most fossiliferous shale and mudstone in this area tends to be the Wanakah shale of the Ludlowville formation and the Windom Shale of the Moscow formation. Also during the Middle to Late Devonian period, the global climate was much warmer than it is today and New York was nearly on the equator. As a result, the warm shallow Kaskaskia Sea was the home to a flourishing coral reef. This tropical reef was home to many invertebrates, such as brachiopods, pelecypods, crinoids, cephalopods, red algae, and gastropods. The corals and algaes contributed to the reef building of the time period. Trilobites such as Eldredgeops (Phacops) were very common. In addition, the Devonian period is known by some as the "Age of Fishes." Armored fish, Placoderms, and primitive sharks lived in the Devonian period. In fact, most modern fish can trace their ancestry back to that time period. By the end of the period, fish had evolved jaws and became the major predators of their time. Unfortunately these realy fish were mainly cartilagenous, so they did not fossilize often. However, the harder dermal armor, scales, and teeth did fossilize. These preserved parts parts became the major links to understanding fish of that time period. It's important to note this area of 18-mile creek and nearby creeks is so large it is divided into distinct sections, with each housing differences in rock formations and fossil specimens. 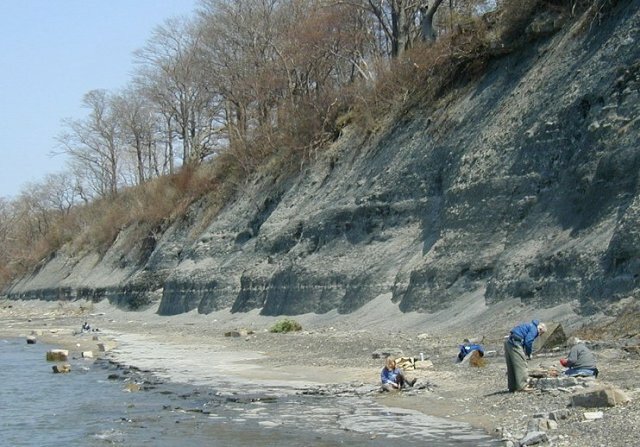 Found at the mouth of Eighteen Mile Creek is the Lake Eerie Cliffs, which contain the same exposures as Eighteen Mile Creek and the Penn Dixie Quarry. For clarification, it is this area and several of the other sections which contain fossils of trilobites, gastropods, corals, crinoids, brachiopods, pelecypods, and cephalopods. This is where we have mainly collected. Cross section of the devonian fossil exposures of 18-mile creek, New York. This diagram is a cross-section of the cliffs, which shows the formations, and different members in the formations. Also, the letters correspond to different faunal assemblages. This is a very family friendly place to collect at. However, don't be fooled, you can bring tools and dig into the famous trilobite layers and find prized specimens. This is a "Fossil Park" that is situated in Hamburg, NY, near the 18-mile creek area. 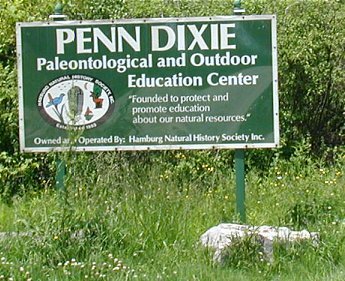 The Penn Dixie Education Center is situated on an old quarry that has exposed the same formations as found at 18-mile creek (however the trilobite layer is found by digging 1-2 feet below the surface). The Penn Dixie Site is open for the public to collect fossils for a small fee. They also have a few "Family Fossil Fun Days" and "Junior Paleontologist Days" during the summer. Please visit their website for directions and dates and hours in which they are open: Penn Dixie Paleontological and Outdoor Education Center . 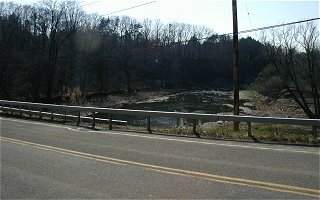 18-Mile Creek is about ten miles south of Buffalo, lying between the Towns of Evans (to the southwest) and Hamburg (to the northeast). More specifically, it is found off of Old Lake Shore Road (this road crosses the creek near its mouth), but be warned there is no parking on the road. There is however a state owned area used for a fishermen parking lot almost under the bridge over 18-mile creek. Once at the creek, you'll notice the expanse of cliffs containing the Devonian exposures. Please DO NOT dig in the cliffs, as the cliffs are private property. There are plenty of natural rock falls to look through. If you hike up the creek a bit to the mouth, you will see the lake Erie cliffs. Someone bought the land and POSTED the lake Erie cliffs as no tresspassing. The Devonian exposures of Western New York are expansive. There are many other spots where you can find fossils. Many geologic publications (including the ones in the recommended section below) feature other sites. Just remember due to development, many areas are now private property. Stay in the creek and DO NOT DIG in the cliffs. Get permission first if you plan to go on private property. • Sturdy Rock Hammer: and Chisels. You need to split the rocks you find! • Protective Eye Glasses: It's time to blow the dust off those old chemistry goggles! • Newspaper/Old Towels: The fossils are very fragile, and can break on your way home. So, pack them up carefully. • Bug Spray: There are lots of ticks and mosquitos in the streams! • DO NOT DIG IN THE CLIFFS: The fossils on this page were found in the talus (rubble) that has already fallen at the base of the cliffs. If you are at a location where cliffs are present, remember it's probably someone's private property. Fossil hunt in the fallen debris. This is the best selling rock hammer. It has a zillion really good reviews and is less expensive than most rock hammers.